Thai New Year, or Songkran is all about fresh starts. From cleaning your home to the world’s biggest water fight, the celebrations are focused on giving you a clean slate for the year to come. Towns all over Thailand ring in the New Year in their own unique way. The hard part is deciding where to celebrate. 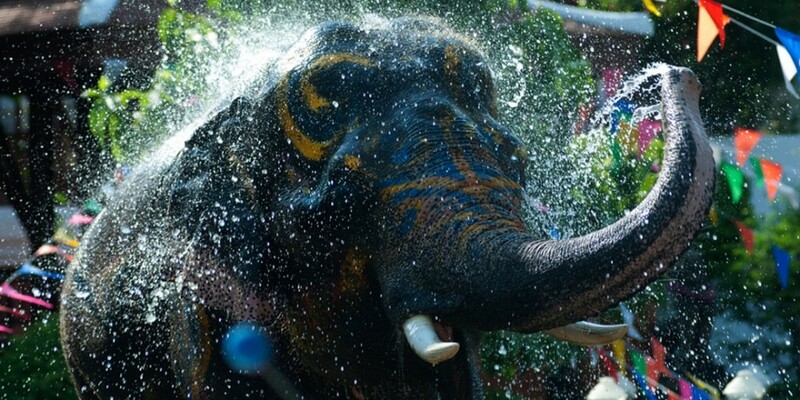 In Ayutthaya province beautifully painted elephants spray onlookers with water from huge barrels, while in Samut Prakan province kindness is displayed in the release of birds and fish to the wild. But it’s not just Thailand that celebrates- Songkran celebrations take place in Cambodia, Laos, Burma and amongst ethnic minorities in Yunnan, southern China, and Arunachal Pradesh and Assam in India. One tradition that spans most of Thailand is the Songkran water fight. What started as a gentle washing has developed into a countrywide soaking! Locals and tourists take to streets to shower each other with water, believed to wash off any misfortunes from the past year and symbolise a new start. So arm yourself with a water gun, put your valuables in plastic and prepare to get wet! After working up a serious appetite from all that action there’s nothing better than heading to the local market or street stall for a tasty snack! Pad Thai is a street food staple and our recipe is packed full of Thai flavour. With prawns, peanuts and filling whole-wheat noodles so you can slurp up your strength for the next Songkran soaking. The second day of the festival is known as National Family day. Children return home to spend time and share a meal with their parents and elders. Create your own homecoming celebration this weekend. Gather the gang and whip up our Beef and Aubergine Curry. Made in Bangkok, our Thai Red Curry Paste Pot is packed with authentic flavours that will bring the scents of Songkran to your kitcken in a flash. Seafood and soup dishes are Thai foodie favourites with Tom Kha Gai found on street carts around every corner. Our Prawn Lemongrass and Coconut Soup has an aromatic coconut broth packed with juicy prawns and adorned with zesty coriander. It will transport your taste buds to Thailand with the first mouthful! Try our Songkran recipes and explore the flavour and fun of Thai New Year in your kitchen. ‘Sawadee Pee Mai’, Happy Thai New Year from Blue Dragon!